The story of the Tuskegee Airmen has been told before, in a perfectly serviceable HBO drama starring Laurence Fishburne, but that adaptation lacked something that Red Tails brings to the screen in abundance: copious amounts of pew pew and vrrrnnnnn and whooooosh and blaow. Producer George Lucas knows from whooooosh and vrnnnn. One of the holy grails of Star Wars fandom is a black & white rough cut of Star Wars where old WWII dogfight footage was cut into the battle of the Death Star. Red Tails, a project he’s been discussing in one form or another since the 80s, hopefully represents the very last of Lucas’ old filmmaking fetishes being worked out on the big screen. He did his car movie, he did his space movies, he did his radio murder mystery and his James Bond as archaeologist films, and finally, he’s got his WWII dogfighting drama up on theater screens, thanks to the work of director Anthony Hemingway. When the film focuses on that dogfighting, it moves with purpose, and achieves a visceral, kinetic fury that rivals Top Gun itself for airborne machismo and thrills. There’s nothing in Hemingway’s resume (Treme, The Wire, The Closer) that even hinted at how well he directs the action in Red Tails, but he brought the goods every time the planes went up, and considering how rote the drama in the movie comes across, he needed to. 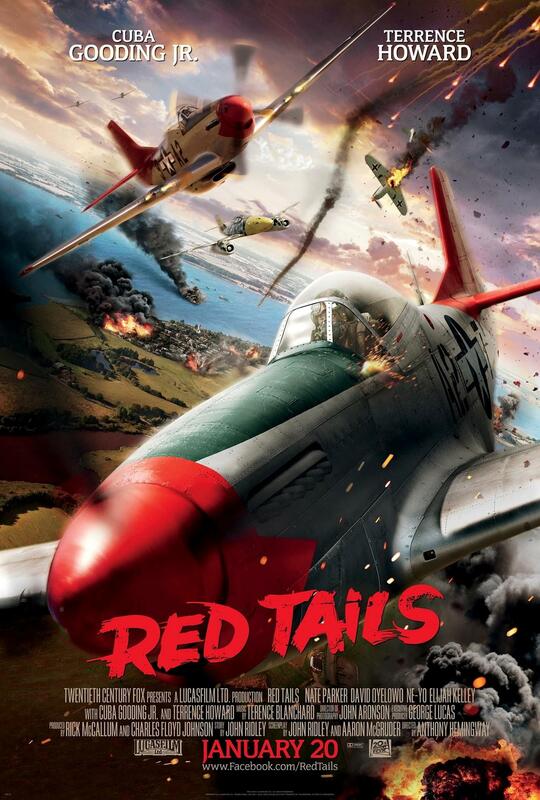 Red Tails makes a few concessions to highlighting the obstacles the Tuskegee Airmen had to overcome, but any social commentary is quickly dealt with as antiseptically as possible so the movie can get back to work being what it really is: an old-school propaganda film. Almost nothing, aside from the color of the cast, veers from that formula; Not the jut-jawed heroism, not the good-natured glorification of war, and not the cornpone earnestness. It’s all there in John Ridley (Three Kings, Undercover Brother) and Aaron McGruder’s (The Boondocks) script, from a story by Ridley and Lucas, for all the good and ill that entails. The actors are doing their best with what that cornball script gives them. There’s a lot of skill up on that screen, with a cast liberally sprinkled with vets of HBO dramas Oz and The Wire. They may be cardboard, but they’re sturdy, and the expressions they’re meant to wear don’t fade or fold. The boisterous loudmouth (Elijah Kelley) stays loud. The grumpy-gus (Andre Rojo) stays grumpy. The wise clown (Ne-Yo) stays smirking, and the fountain of platitudes (Terrence Howard) spews cliches and inspirational speeches in a watery voice every 15 minutes on the dot. Unfortunately, Red Tails shares a story that has more in common with Titanic and Pearl Harbor, in that there’s trite and often boring subplots and sidetracks in a misguided attempt to take the audience even further into the heads and hearts of our heroes: Lightning (David Oyelowo) finds love while buzzing an Italian village, and romance blooms despite the language barrier. Raygun (Tristan Wilds) gets caught behind enemy lines and teaches a group of white P.O.W’s that color doesn’t determine character. And Easy (Nate Parker) does battle with the bottle in a manner just as bland and artless as anything in the movie that isn’t gleefully blowing holes in Germans. And despite the jacked-to-the-eyeballs, adrenaline-infused remix of the old dogfight reels Lucas once cut into Star Wars, Red Tails plays more like one of the simplistic nickel comics of the 40s, featuring tales of derring-do, done by granite heroes in bomber jackets. It has to be intentional, the adherence to a storytelling ethos that says hold every hand, draw an arrow pointing to every key story beat, and luxuriate in every whoom, boom, and kraka-thoom. Red Tails is just as flat and two-dimensional as those war comics. No shading, no depth, but then again, nuance wasn’t a big pre-requisite for those stories. They weren’t trying for that, and neither is Red Tails; They gave you good guys, they gave you bad guys, and at the end, the bad guys blew up, the good guys puffed their chest out, and you chucked your popcorn in the garbage and hopefully exited with a grin, reciting the only dialog worth remembering: vrnnnnnnn and whoooooosh and pew pew pew.